Whether it is the death of the restaurant owner or if the owner prefers to live a stress-free life from all the hustle and bustle of the food business industry, it is significant to document a business ownership transfer and follow the regulations of the state. With this, several types of legal forms and paperwork will need to be created and prepared for the transfer procedure. One of the essential documents that the owner must have is known as a restaurant transfer of ownership form. 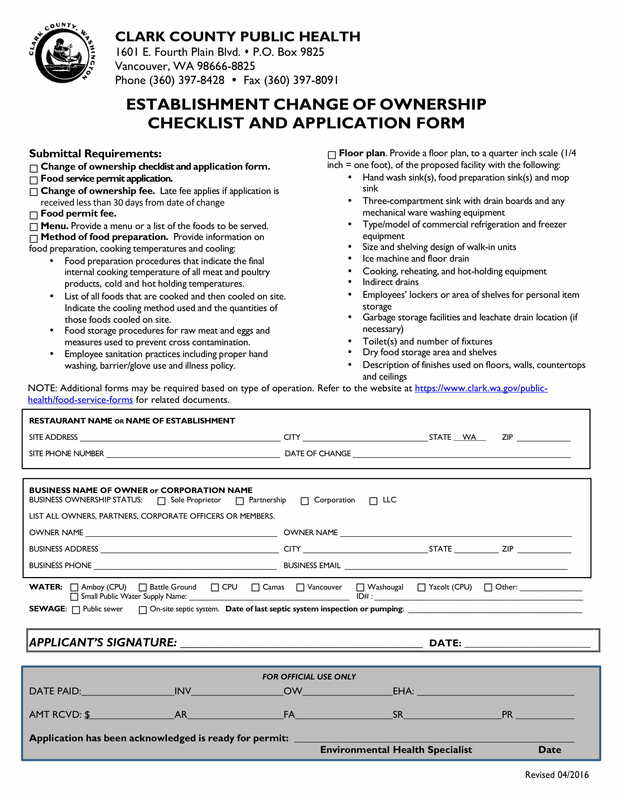 What Are Restaurant Transfer of Ownership Forms? Restaurant transfer of ownership forms are documents that are necessary for conducting a legal transfer of a restaurant business. The form is a type of legal contract agreement wherein the former and the new owner will be agreeing to the terms of the business transfer. Although it is common that a business transfer is made between two businessmen who are interested in the same field, it is not limited to business-minded individuals or buyers since a restaurant business transfer can be made with the owner’s family and spouse. There are different methods that a restaurant business owner can consider when transferring his business ownership. The first is through a last will and testament, which will only be transacted once the owner is deceased. Another is by transferring the business title as a gift to a relative, whether the owner’s spouse, children, or close family member. Some states will require the owner to pay for gift taxes if the value of the business is beyond the state’s limitations regarding gift transfers. Additionally, transferring a business ownership through a sale is also the most considered by restaurant business owners since this allows them to acquire a large sum of money from the payment of the buyer. 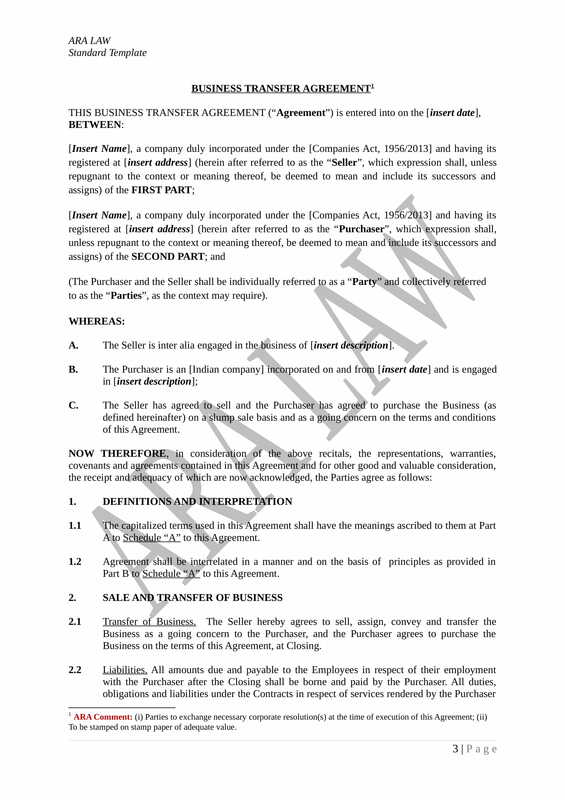 Along with this transfer method, the owner and the buyer must not only have a restaurant business ownership transfer document but also a buy-sell agreement form. The agreement is intended to lay down the terms, conditions, and payment obligations of the buyer toward purchasing the business. On the other hand, a partial sale method can also be made if the buyer is not ready to provide a full payment for the restaurant business. With this method, a private annuity agreement will be signed along with the transfer of ownership form, which is for assuring that the buyer will be responsible for giving the payments periodically to the former owner of the restaurant. Regardless of the varieties available online, it is always ideal if a restaurant business owner knows the sections and significant areas of any restaurant transfer of ownership form. Below are the sections that the owner must review in order to assure that his intentions of transferring his business ownership will be met legally. Objectives of the form – This must indicate why there is a need for completing the document along with a set of instructions for the users. In addition to this, the name and the logo of the company or agency who is responsible for creating the form must be included as well above the objectives. Restaurant business details – This is where the user or the restaurant owner can disclose the description of his restaurant business ranging from the name of the restaurant establishment and their address. The name of the manager, the contact information of the restaurant, and the number of staff in the business establishment must also be included for further details. In the event that there are two owners, the names of both owners as the primary and the secondary proprietor should be stated with their titles and contact numbers. Food handling and managing activity – This refers to the date of when the transfer of ownership will be observed and mandated. Basically, the owner must indicate whether there will be an expected change in the way the restaurant will be managed or not. The description of the food that is formerly sold and served as options in a restaurant menu must also be enlisted to distinguish what changes will occur based on the agreement of the owner and the buyer of the restaurant. Declaration statement – This legal statement will acknowledge the identities of the previous and the soon-to-be-owner of the restaurant business. Both owners must indicate their confirmation regarding their transaction and the date of when the purchaser will take over the business. Legislation and guidelines – This section must lay down the rules and the regulations pertaining to selling or transferring a restaurant business ownership. The contact numbers of the associated organizations and agencies who will be providing permits and certificate updates to the new business owner must also be stated in order to allow the new owner in knowing who to reach out for him to legally register his business. Why Use Restaurant Transfer of Ownership Forms? 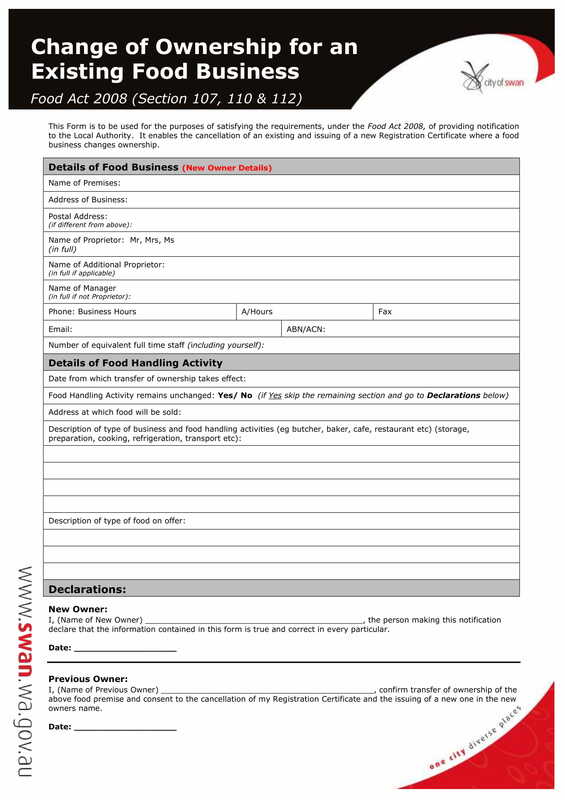 The main intention of using a restaurant transfer of ownership form is to document the transfer. The form will also allow both parties to determine the risks of the ownership, which are necessary for informing the new owner about what issues and concerns are evident in handling the business. Additionally, the form will highlight the prices and the payments needed in order for the purchaser to fully own the restaurant business. Creating a restaurant business transfer ownership agreement is not easy since it is significant to take into consideration the variables, factors, and the rules of the state regarding restaurant legal contracts and agreements. However, with the aid of a professional individual, such as a lawyer, any restaurant owner along with their business partners and purchasers will be able to make an effective and sustainable ownership agreement. Step 1: Make the title page. The owner must incorporate the name of his business, the type of document he is creating, and the names of the parties involved who are the purchaser and himself. 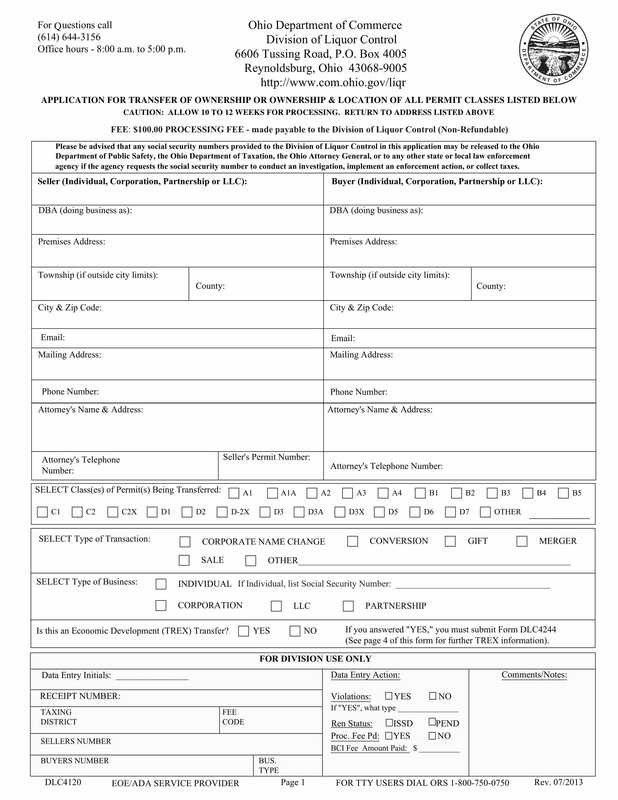 This must be indicated on the primary page of the form which will have the date of when the document is created. Step 2: Create the introduction. This must highlight the objectives of the agreement, the names of the parties, and their individual addresses and companies. An additional area of this section centers on the state’s regulations and laws which are associated with the business ownership transfer. Step 3: Enlist the vocabulary used in the agreement. The definitions and interpretations of the words, phrases, and other matters of vocabulary must be detailed in this section. This assures that all the parties will have a uniform understanding of the statements used in the form. Step 4: Place the liabilities associated with the agreement. This section is also referred to as the sale and transfer business section which will focus on assigning liabilities, risks, and granting licenses to the purchaser of the restaurant business. In addition to this should be a statement that indicates the intention of the owner to sell his restaurant and acquire a legal agreement with the purchaser. Step 5: State what will be happening to the employed individuals of the restaurant business. The owner of the restaurant needs to determine whether he will be recommending employees for the business or each person will be provided with a termination letter prior to the day of the closing. The owner must also state his acknowledgment of the responsibilities regarding the employees’ salary, wages, and entitlements. Step 6: Name the purchase price of the restaurant establishment and business. This section must also include the deductions and taxes that accompany the purchase. If the seller prefers to take care of the business tax by himself, then he needs to indicate that he will be solely responsible for paying the taxes before the business will be transferred to the purchaser. Step 7: Enlist the representations, warranties, and conditions for the ownership transfer. This section is allotted for securing that the statements made by the owner about the transfer are true and correct. The obligations of the purchaser after the closing are also laid in this section. Step 8: Indicate the rules to be observed prior, on the day, and after the closing. 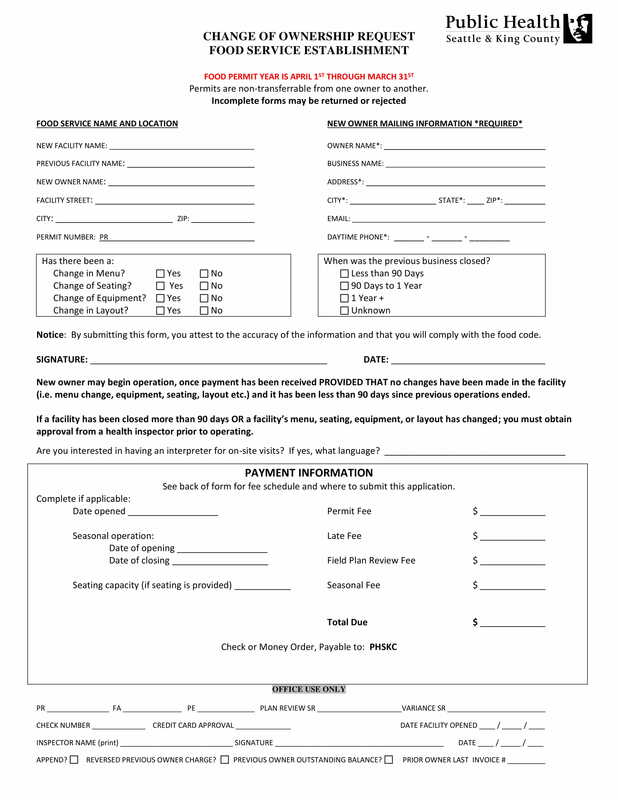 This is significant to allow both parties know when the payment notice form must be delivered along with other restaurant forms which are essential to aid the new owner in managing his new business. Step 9: State the conditions subsequent and indemnification. The conditions are addressed to the former owner or the seller of the business. This includes the seller’s obligations in clearing out the balances of the establishment as well as negotiate to the purchaser in order to obtain an agreement. On the other hand, the indemnification is for assuring that the parties have arrived at a decision for a hold-harmless agreement regarding their individual liabilities, assessment payments, and other relative financial and business concerns. The procedures for the indemnification, claims between the parties, and the rights of each party are also stated on the form. Step 10: End with the term and termination clauses. This is for informing the purchaser about what will be the possible cause of a contract termination and when the contract will take into effect. This includes details about bankruptcy as well as a breach of warrant. With the aforementioned steps, a restaurant business owner will be able to sell his establishment and ownership title to a rightful individual who is knowledgeable about the obligations and responsibilities accompanying the business. Nonetheless, the form must be enclosed with other necessary forms which will then be submitted to the state’s agency who keeps records of new businesses.